Could your website be doing more? Find out in Oneupweb’s latest study. 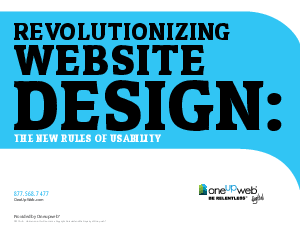 Today, the design and usability of your website directly affects your bottom line. Discover if it’s driving sales, or driving them away with the new measurement you need to determine the success of your site’s design. And, see how 100 websites across four industries- spanning e-commerce to higher education- measure up and why it matters to your business. Get the full report from Oneupweb today.